Home to some of the world’s largest permanent collections and with a wide range of art on show, a school trip to London is guaranteed to incite a response from pupils and enrich and inspire their work. In this exciting city, pupils will get to take in the latest thought-provoking collections, museums, galleries and innovative talent, whilst developing an understanding of British heritage and culture. Add to that the huge array of tourist attractions on offer and you’ll be guaranteed a trip to remember. At a glance Getting there We offer a range of options to get you to and around your destination – and back home again – with ease, including executive coach and rail. • If you are on a budget then London offers plenty of free, fun and educational museum visits which often include workshops Eating out NST can pre-book meals at a range of restaurants making it easier for you. departure points, travelling in November 2019.
and some spending money for souvenirs! London is awash with inspiration to add to every pupils’ portfolio of work. designs spanning graphics to furniture at the Design Museum. pieces from the designer’s personal archive. TATE MODERN 11th July 2019 – 5th January 2020 Experience the remarkable world of this endlessly inquisitive artist. In 2003, hundreds of thousands of visitors came together in Tate Modern’s Turbine Hall to experience Olafur Eliasson’s The Weather Project – a glowing sun visible through fog. In 2019 he will return to Tate Modern for a major survey of his career so far. Eliasson creates experiences that can be shared by young and old – the exhibition includes a selection of these captivating immersive installations. sounds, smells and enjoy a spot of street photography. Portobello market makes an interesting choice with its quirky, colourful shopfronts. ‘Wow’ buildings span many architectural eras and include castles, cathedrals, theatres, temples, skyscrapers, Ferris wheels and palaces. Your group could document the urban landscape and varied architecture from above at the Shard or London Eye. There are great sculptures dotted around the city too. Keep an eye out in public squares, courtyards, parks and outside stations. Feed the emotion of other art forms into portfolios with a trip to the West End. Appreciate the staging and costumes of The Lion King, or take a backstage tour at the National Theatre to see prop and costume making on site. NST work with staff on the planning and organisation of the galleries and museum visits for our pupils. They listen to what is required and try to get the best value for the pupils. I have planned all my trips with them for the last 7 years. contemporary fashion, textiles and jewellery. include Giotto, Duccio, and many more. from Lucian Freud and post-war painters. Day 2 The National Gallery - sketching time. Free time in Covent Garden. plays host to exhibitions, education and debate. • LONDON TOWN WALKING TOURS	Old Street, Spitalfields and Shoreditch have become London’s capital of street art. See continually changing art and learn about Banksy. nothing says iconic like The Coca-Cola London Eye. from Big Ben to The Houses of Parliament. New for 2019 – enter the set of Gringotts Wizarding Bank! Beckham, Lady Gaga, the Queen and many more. Royal Fusilier Museum and Jewel House. book any show for your group. cruise and gain an insight into London’s history. storyboard and model, resulting in the final set. Day trips to London are a very popular option to give pupils an insight into city life, with limited time out of the classroom. Whether you’re looking to take in a few galleries or even venture onto the tourist trail, London offers it all. Movie Graphic Design - Learn the processes involved in creating movie graphics TM & © 2019 Warner Bros. Entertainment Inc. Harry Potter Publishing Rights © JKR. and large selection of conference rooms. Cornwall has been attracting and home to world-class artists for centuries. Stunning and sleepy fishing villages, such as St Ives, combined with magical natural light give a jaw-dropping and inspirational setting for any aspiring artist. Your students can walk in the footsteps of Barbara Hepworth, Bernard Leach, John Opie or many more influential Cornish artists. With your group based in St Ives, you will easily be able to take in the Tate St Ives, Barbara Hepworth Museum or undertake a specialist art workshop. have to look up to see a view worth painting. eye views of the town • St Ives beaches. modern art in St Ives. Where you will be staying Cohort Hostel School-group friendly hostel accommodation in the centre of St Ives. Price includes: 2 nights’ full board accommodation, executive coach transport from and to your school and throughout your stay, group travel insurance & 1 in 8 free place ratio. Price shown based on 40 paying passengers from selected departure points, travelling in February 2020. Liverpool has the largest collection of galleries and museums outside London, which means that it is the perfect place to choose for an educational school trip. Its mercantile architecture situated on its striking waterfront is a concrete reminder of its past. The famous Albert Docks, dating back to 1839, cannot be missed as it it a significant landmark in British history as it reminds us that Liverpool was once an important global port. Why not explore the latest exhibition at the Tate or the Open Eye Gallery - the only gallery dedicated to photography. Price includes: 1 night B&B accommodation, executive coach transport from and to your school and throughout your stay, group travel insurance & 1 in 8 free place ratio. Price shown based on 40 paying passengers from selected departure points, travelling in November 2019. A city bursting with charm and character, Art is available in abundance, with Manchester school trips often boasting a number of fascinating galleries on their itineraries. Why not explore the latest exhibition at the Whitworth Art Gallery, or delve into the works of one of the region’s most famous artists L.S Lowry? Home to some of the world’s iconic works of art, a school trip to Paris will open your pupils’ eyes to a city that has attracted and inspired generations of artists. Paris is the perfect destination for groups seeking to support portfolio building through exploring a choice of galleries and museums whilst enjoying the history and culture of this vibrant French city. executive coach via ferry or Eurotunnel, Eurostar and flights. Flying time Flights from London – 1 hr 15 mins. When to go Paris is a year-round destination. Good to know • We can pre-book your meals and metro passes so you don’t have to worry about this when you arrive. • Bastille Day (14th July) and the days around this are best avoided as many roads are closed. We will plan your itinerary accordingly. • Eiffel Tower queues can be huge. We highly recommend the Montparnasse Tower which is quieter, more affordable and offers a great view of the city, including the Eiffel Tower. Price includes: 2 nights’ B&B accommodation, executive coach transport from & to your school and throughout your stay, services of an NST Paris City Representative to assist with check-in & provide 24 hour assistance, extensive group travel insurance & 1 in 8 free place ratio. Price shown based on 40 paying passengers from selected departure points, travelling in February 2020.
to celebrate the 500th anniversary of his death in Amboise in 1519.
embodies Renaissance on his own and his genius is still fascinating 500 years after he passed away. are filled with fashionable art galleries and museums, and makes an must. Take your sketchbooks on a stroll through the cobbled streets and look out over the city from the steps of the stunning Sacré-Cœur. This is a great area for street photography too. Photographers can also take to the skies and snap the stunning cityscape. Groups highly recommend the view from Montparnasse 56 Panorama. Close by is the Montparnasse cemetery, the resting place of many of France’s artistic elite and a fascinating stopping-point for art history buffs. Very helpful all through the process, from planning to the actual trip. I always had a prompt and effective response. All documentation was accurate and reassured us enormously. All enjoyed themselves immensely. Art & Design through to A-Level. Seth, Inti, Vhils, D-Face and C215. 1930s Decorative Arts, Surrealism, and more. tours and audio guided tours. the city, accompanied by lively commentary. population could learn the Bible stories. Eiffel Tower and a fabulous view of Paris. to work together and bond as a class. • MUSÉE NATIONAL RODIN Here, Rodin’s works can be studied in context in the artist’s beautiful house and gardens. Met by NST City Representative, who’ll provide check-in assistance. Day 2 Louvre - sketching time. Free time to explore Montmartre. FIAP JEAN MONNET This simple, clean accommodation comes highly recommended. although in a remote location, offers easy access to Disneyland® Paris. RESIDENCE INTERNATIONAL DE PARIS A simple youth centre offering functional accommodation and particularly good facilities for disabled persons. B&B HOTEL PARIS DISNEYLAND A modern, functional hotel located in an eastern Paris suburb. Clean rooms and well-maintained. A school trip to Barcelona offers pupils the chance to see amazing architecture, some of the best art galleries in the world and the works of world-renowned artists including Gaudí, Picasso and Dalí. The rich history of the city, as well as the talents of many wellknown artists, is visible throughout the city’s many museums, landmarks and educational visits. This is a year-round school tour destination where pupils can gather inspiration from their surroundings and draw from first-hand observation. At a glance Getting there We offer flights to Barcelona from a variety of departure airports. Barcelona is a year round destination, but most popular between February and October. Good to know • When taking the metro, the T10 tickets are good value for money. • On a budget? The MNAC is free for school groups, as is the Museu Picasso. Park Güell has a free section and even just seeing the exterior of the Sagrada Família is very impressive. • Pack comfortable footwear as there is a lot to see and do and citybased groups will travel mainly on foot and by public transport. Price includes: 3 nights’ B&B accommodation, return flights from a London airport (other departure points are available) & overseas airport transfers, services of an NST Barcelona City Representative to assist with check-in & provide 24 hour assistance, extensive group travel insurance & 1 in 10 free place ratio. Price shown based on 30 paying passengers travelling February 2020.
where art and design is concerned. The first major retrospective exhibition of the work of the Barcelona photographer Oriol Maspons will present more than 40 years of intense activity. Covering reportage, portraiture, fashion and advertising, contextualizing his production and providing support for the research in the recovery of documentary material – books, magazines, record covers, etc. – the exhibition will also show us the final destination of the artist’s photographs. element in the city with museums dedicated to Picasso, Miró and Dalí. Flamenco shows provide cultural inspiration, and street artists and photographers will be thoroughly entertained with people-watching on Las Ramblas. exhibition, and included in the visit is a virtual reality experience in which you can meet with Gaudí himself. 19th-20th century art and photography section. experimental cubism and abstract forms. for the study of form, colour and texture. characteristic buildings from all over Spain. • LAS RAMBLAS Pupils will enjoy wandering along this famous street with its variety of shops, cafés, market stalls and street entertainers. is a true cultural experience. Check-in assistance from NST City Representative. Free time at Port Vell. Day 3 Gaudí day - Casa Milà and Gaudí experience. Shopping & time at leisure. really competitive price. Popular with pupils of all ages. HOTEL ROMA REIAL Good, budget accommodation in a lively, central location. Best suited to older school groups. SAFESTAY BARCELONA PASSEIG DE GRÀCIA A small, simple budget youth hostel with 55 rooms, in a prime city centre location in Barcelona. We always get great service from NST. I have used them for years and feel comfortable that they know what I want now. Our last Spain trip was fabulous. The hotel was perfect for our needs, the excursions were well planned and everything went very smoothly. Soak up the Spanish culture and explore the many museums, monuments and parks during a stay in this large and lively city. Madrid is an exciting and cosmopolitan destination, offering excellent educational visits, and the chance to sketch the many fountains, cathedrals, dazzling Bourbon architecture and boulevards. We can focus your itinerary on the main artistic attractions, whilst also including some less well-known collections, all interspersed with exciting sightseeing opportunities. • On a budget? The Prado and Reina Sofia are both free museums, but very popular and often booked up. We’ll arrange your itinerary around available dates if these museums are on your wish list. • Pack comfortable footwear as there is a lot to see and do and groups will travel mainly on foot and by public transport. a London airport (other departure points are available) & overseas airport transfers, services of an NST Madrid City Representative to assist with check-in & provide 24 hour assistance, extensive group travel insurance & 1 in 10 free place ratio. Price shown based on 25 paying passengers travelling February 2020. We had an amazing time in Madrid. The itinerary was perfect for what we wanted as an art group. Our NST advisor was able to accommodate all of our requests. Madrid is such a beautiful and vibrant city. We saw art from medieval times through to contemporary installations. The hotel was clean and in such a fantastic location. The staff were friendly and understood our teenage group. The evening meals provided a good choice and variations. The airport NST rep was so helpful and friendly. The Madrid rep helpfully pinpointed all of the places that we were seeing on the map. She also gave us helpful local knowledge. I am starting to plan my trip for next year. lake and a variety of events. flamenco clothing up close and in action. world’s most famous sporting clubs. Day 2 Museo del Prado. of attractions and shows for pupils to explore. important private art collection in the world. HOTEL MEDIODIA A budget hotel offering simple rooms and good value for money. Hotel Mediodia is located in the heart of the city centre, close to all major museums and attractions. Day 4 Centro de Arte Reina Sofia. Study a wide spectrum of art in one visit. From Van Gogh and Rembrandt to many other renowned artists, Amsterdam has it all. What’s more, during 2019, special activities and exhibitions will be taking place throughout the Netherlands in celebration of Rembrandt and the Golden Age, shedding light on Rembrandt’s life and work from different angles. This colourful destination, with a wealth of art, picturesque countryside, iconic windmills, canal towns and fields filled with tulips, is certain to inspire your art students. extensive group travel insurance & 1 in 8 free place ratio. Price shown based on 35 paying passengers from selected departure points, travelling in February 2020. Where you will be staying MEININGER HOTEL AMSTERDAM CITY WEST A very modern and comfortable hotel which offers a high standard of room as well as good in-house facilities. Safe location with excellent access to public transport links to central Amsterdam. The largest collection of Van Goghs in the world. collection of works by other 19th-century artists. features works by Rembrandt and Vermeer. also includes the restored Rembrandt’s house. See the major sights of Amsterdam as you travel along the canal. • EFTELING THEME PARK Known as the World of Wonders where fairytales come true, this is the most popular theme park in the Netherlands. This theme park is home to ‘Aquanura’, the largest water show in Europe. develops, defines, publishes and stimulates. How did Rembrandt make his paintings and etchings? How do we go about investigating this today? Uncover how, why, when and where art is used to influence people. A school trip to the vibrant and cosmopolitan city of Berlin offers a wealth of art and design opportunities from world-class galleries to the open-air Berlin Wall East Side Gallery. Berlin has become a hot spot for the international art world. Few other cities have such an extensive and concentrated art scene that’s as varied and original. Here, your pupils will learn how Bauhaus influenced the nature of design and architecture in the 20th century. • The best way to get around is by foot and on the S Bahn and U Bahn. Purchase small group tickets to save on cost. Our City Representative can assist you. • Most shops are closed on Sundays with several museums closed on Mondays. We’ll plan your itinerary accordingly. • The festive Christmas markets make a great itinerary addition in November and December. assist with check-in & provide 24 hour assistance, extensive group travel insurance & 1 in 10 free place ratio. Price shown based on 25 paying passengers travelling in November 2019. This was our second trip organised by NST and it was another brilliant success. The itinerary was really well planned, accommodation was very good, and the pupils really enjoyed their visit to Berlin. Sam was excellent with planning our trip. I would definitely use NST again in the future. from the Collection of Classical Antiquities. explore exciting exhibitions on diverse topics in the history of photography. • GUIDED CITY TOUR Learn about the history of key city sights. which collects art - both local and international dating from 1870 to the present day. and a free exhibition. Take a tour of this now redeveloped sporting venue. After the Berlin Wall came down in 1989, hundreds of artists gathered and transformed the east side of the Wall. former West and former East Berlin. Check-in assistance from your NST City Representative. Free time for local orientation. Day 2 Hamburger Bahnhof Museum. Day 3 Museum für Fotografie. Visit Potsdamer Platz for a film at the IMAX cinema. SCHULZ HOTEL A brand new hotel with 350 rooms, centrally located. A very modern and comfortable hotel with excellent facilities. Hotel was built with school groups in mind and provides excellent group. Showcasing Renaissance, Baroque and Neoclassicist roots in its impressive architecture, Rome is a must-see destination for pupils seeking inspiration from more traditional approaches to art and design. Home to famous museums including the Vatican Museum and Sistine Chapel, Rome is certain to inspire your pupils. Paintings, sculptures and artefacts covering a range of styles and eras can be seen in the Eternal City, making it the ideal place for your pupils to focus on traditional approaches to art. Rome is a year-round destination with Easter being particularly busy with Pilgrim groups. Local currency Euro Good to know • The best way to get around is by foot and on the metro. Our City Representative can assist you. • National museums are closed on Mondays. We’ll plan your itinerary accordingly. Price includes: 3 nights’ B&B accommodation, return flights from a London airport (other departure points are available) & overseas airport transfers, services of an NST Rome City Representative to assist with check-in & provide 24 hour assistance, extensive group travel insurance & 1 in 10 free place ratio. Price shown is based on 30 paying passengers travelling in February 2020..
Visit showcase ROME’S GREAT GLADIATORIAL ARENA: THE COLOSSEUM This has to be the most thrilling of the city’s ancient sites, where gladiators fought wild animals, or even each other. Transport your group into the past and witness the three parts of the structure; the arena (where battles took place), the cavea (where spectators sat) and the podium (a broad terrace in front of the tiers of seats, reserved for emperors, senators and VIPs). A truly fascinating insight into ancient times. of Gian Lorenzo Bernini and paintings by Raphael. collection in Italy of 19th - 20th century works. collection quite unique in the history of painting. check in & discuss your itinerary & orientation in the city. HOTEL NOTO The Hotel Noto offers a good standard of accommodation in a central location. Trevi Fountain & Spanish Steps. Day 2 Guided tour of Vatican Museum & Sistine Chapel. Stroll down the Via del Corso, enjoy the window shopping! Day 3 Galleria d’Arte Moderna. HOTEL ARCHIMEDE The Hotel Archimede offers good quality accommodation within easy reach of the main tourist areas of Rome. Venice is an artistic treasure trove, housing the collections of world-renowned artists such as Bellini and Piero della Francesca. Your group will have the opportunity to see works by Venice’s grand masters in situ, including collections from artists such as Titian, Tintoretto and Bellini, whilst artistic riches of the Venetian school can be found at the Galleria dell Accademia. In this enchanting city you will also find a contemporary art scene that lives up to its glorious art history. Getting there We offer flights to Venice from a variety of departure airports. When to go Venice is a year-round destination, although during February regular high tides means the city is more prone to flooding. Remember to take your wellies! Good to know • Visit St Mark’s Basilica first thing in the morning if you want to avoid the queues. • National museums are closed on Mondays. We’ll plan your itinerary accordingly. Biennale Arte 2019 58th International Art Exhibition, titled May You Live In Interesting Times. 11th May 24th November 2019. Galleria Dell’Accademia The Accademia is home to some of the finest art collections in Venice. Peggy Guggenheim Museum An impressive, small museum on the Grand Canal giving an insight into modernist development. Price includes: 3 nights’ B&B accommodation, return flights from a London airport (other departure points are available) & overseas airport transfers, extensive group travel insurance & 1 in 10 free place ratio. Price shown based on 25 paying passengers travelling February 2020. Getting there We offer flights to Florence from a variety of departure airports. When to go Florence is a year-round destination. Basilica Santa Maria Novella The Basilica is home to some important frescoes such as Masaccio’s Trinita (1428). Uffizi Gallery One of the world’s finest galleries featuring all the great names of the Florentine Renaissance. Torre Pendente (Leaning Tower Of Pisa) Built from 1173, the tower began to lean almost from the outset. A must-see for art groups. Where you will be staying Golf Hotel The Golf Hotel offers friendly, comfortable accommodation close to many major tourist attractions. Price includes: 3 nights’ B&B accommodation, return flights from a London airport (other departure points are available) & overseas airport transfers, extensive group travel insurance & 1 in 10 free place ratio. Price shown based on 25 paying passengers travelling in February 2020. An art and design school trip to New York offers pupils the chance to see some of the most dynamic contemporary art in the world. This ever-evolving art and design scene is home to influential, modern art museums including the Guggenheim and MoMA, plus you’ll find an outstanding selection of photography museums here too. A study tour to this dazzling destination will leave your pupils feeling excited and inspired. At a glance Getting there We offer flights to New York from a variety of departure airports. Flying time Flights from London – 7 hrs 30 mins When to go New York is a year-round destination. Each season offers visitors plenty of reasons to visit. Good to know • New York is best explored on foot or via subway. We can help you with subway ticket options. • Marathon week in November can be very busy. We’ll advise you on the dates to avoid. • Don’t forget to budget for tipping. We can offer you advice on how much to take. Price includes: 5 days, 3 nights’ room only accommodation, return flights from a London airport (other departure points are available) & overseas airport transfers, extensive group travel insurance & 1 in 10 free place ratio. Price shown based on 35 paying passengers travelling in November 2019.
venue to inspire your students - and in 2019, MoMA will expand! line elevated above the streets. This is an epic location from which to view and document the city. Keep an eye out for the public art projects too. those interested in the work of other cultures. works by artists such as Klee, Leger, Mondrian. devoted to historic and contemporary design. Offers centuries of achievement in the art of design. vocational aspects of art and design. the photographic medium through acclaimed exhibitions and education programmes. arena with the ‘All Access Tour!’. mainstream form of artistic expression. • NBC STUDIO TOUR Enter the world of American television on this historic tour through the halls and working studios of NBC’s New York operations! Daytime flight & transfer to accommodation. Met on arrival by a local agent representative for an escorted transfer to accommodation. Empire State Building. Day 2 The Guggenheim. Metropolitan Museum of Art. Free time. Day 3 Visit Chelsea Commercial Gallery District. Visit Bowery Neighbourhood . Free time to explore the National September 11 Memorial and shop at the Century 21 dept. store. Day 4 MoMA. Transfer to airport for overnight return flight to UK. Day 5 Arrive in the UK. For prices for this itinerary, please call us. in the Midtown West area of Manhattan. in a nice location. Management staff have comprehensive knowledge of group requirements. standard of accommodation in an excellent central location. mid-town Manhattan. Groups are assured a comfortable stay. Ready to start planning your next learning experience? Let us create a trip specifically for your group. Visit nstgroup.co.uk for details and itinerary suggestions or call our school travel experts on 0845 293 7975. Art & Design LIVE! New York Tuesday 18th February 2020 An immersive event, held at the prestigious MoMA, your students will hear from a variety of professionals who’ve made art their business providing great advice and insight into the possible careers they could pursue within this sector. Our LIVE! student event combines: Expert speaker presentations - a chance to hear from artists and art industry professionals first-hand. Q&A session - interactive question and answer sessions where students can find out more about the speakers’ career paths and the opportunities for future study, offering inspiring and invaluable career advice for anyone considering a career within the creative world. Art & Design LIVE! 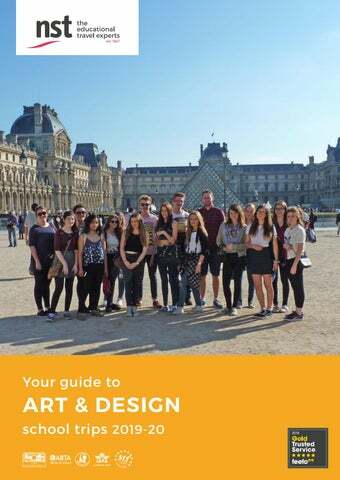 Aimed at KS4 & KS5 students - meeting exam board specifications for AQA, OCR, EDEXCEL, WJEC and SQA and encouraging students to see the world through an artist’s eye, build their portfolio and provide inspiration, whilst broadening their understanding of careers in the arts.